In the "Why didn't I think of this before" category we have a super-simple unipolar peak flasher using the ubiquitous and cheap TL431 shunt regulator as a comparator. 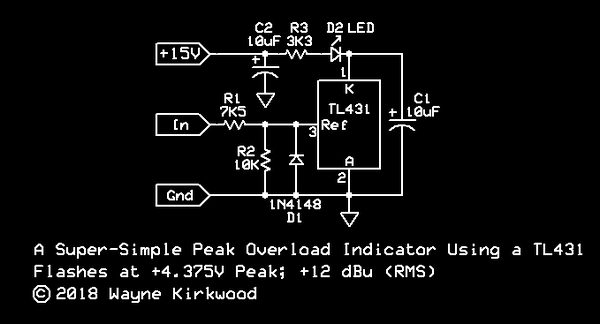 A Super-Simple Peak Flasher/LED Overload Indicator Using the TL431. The internal reference of the TL431 is 2.5V. The LED will illuminate when the voltage at pin 3, the Reference input, is greater than 2.5V. With the values shown, the peak flasher is calibrated to trigger at +4.375V peak based on the voltage-divider formed by R1 and R2. R1 and R2's ratios can be adjusted and/or scaled to provide thresholds >2.5V up to tens of volts. The TL431 and external diode D1 clamp negative-going inputs. When R2 is open for a threshold of 2.5V, R1 should remain in-circuit to limit input current. R3 sets the LED current. C1 acts as a peak hold circuit by delaying LED turn-off. As with any peak detector, there's a lot of discharge current in the loop formed by C1 and the TL431. Large ground currents flow so beware in layout. Without C1 installed switching is very clean without the type of oscillation you'd normally see with an LM339/393-type comparator. There is a stability boundary area for the TL431 when used as a shunt regulator with feedback. Values >10 uF or virtually no capacitance at all are acceptable in the Zener configuration. I don't know if a stability boundary applies in the peak flasher comparator configuration since there is no feedback. I didn't see any oscillation during switching transitions. As a practical matter you'll want a big output C1 anyway to make the display persistent. 10 µF seemed about right to my eye for the 4 mA LED current I was using. It doesn't get much simpler than this: A single 3 pin TO-92 package and you're done. The detection is unipolar (positive peaks) which for near-overload indication is usually good enough. Though I haven't tried it I suppose you could use two TL431 on a balanced output and combine the Cathode terminals, "K," for bipolar detection. For true bipolar detection and gain for detection below 2.5V a single-op amp absolute value circuit could be used ahead of the TL431. The circuit can also be used as an above-threshold indicator for a compressor. With 1 dB overdrive (+13 dBu) the LED stops illuminating around 500 kHz. At the same level of overdrive, a single-cycle tone burst of 20 kHz will trigger the LED. The TL431 is normally used as a shunt regulator or "programmable Zener." When the TL431 is used as a 2.5V reference, the Reference pin and Vout are tied together. The TL431 acts like a 2.5V Zener. A voltage divider from Vout to Reference and Ground can be used to scale the output voltage to make it a variable Zener. In the level detect/comparator configuration there is no feedback. The reference input is driven directly and the TL431 operates open loop. When the Reference input is >Vref (2.5V) the output goes low. Its functionally an LM339/393 comparator with an on-chip reference and only 3 pins. If you're looking for a simple and easy indicator of signal presence, near clipping or above threshold this simple circuit may fit the bill. I think I have a good off label application for this. The Output amplifier of my console has P&G rotary fader at the output. The fader doesn't have a switch at the top of the throw. The fader is a six channel unit. I use four of the channels for audio. I'd like to know the fader is in the same spot at the top of the throw in a calibrated position. I could tune this circuit to trip at the top of the throw so I know the fader is in its calibrated position. I am having trouble getting excited by this... looks like an application engineer trying to sell chips. Last edited by JR. on Mon Apr 30, 2018 8:50 am, edited 1 time in total. Glad (very glad in fact) that I don't work for you. When I managed an engineering group that required many peak indicators, that design would not be seriously considered, but maybe I am missing some features that it provides and I don't see. PS: I was just out in the yard shooting at squirrels with my bb gun, so that puts me in a better mood. Does it have some inherent hold capability? You must not have read the part about it detecting a single-cycle of 20 kHz low rep-rate tone burst. Not many op-amp solutions are that fast even at 2.5V. At 4 mA with 10 uF and a modern hi-eff LED that single 20 kHz burst that flashes is as bright as continuous. If I were using a white LED I'd be blinded. EDIT: Forgot to mention the the TL431 in the Zener configuration has up to 100 mA current capability. That 100 mA output has more current than any common op amp or comparator. The 100 mA output can discharge C1 very, very quickly. Don't let its simplicity fool you. You're talking to the guy who built this. I've never been able to do anything this good, this simple, with as few parts for a high-level overload flasher. This is DIY not Peavy and sometimes you need something simple and easy-to-build on a perfboard. This is about a close to a "single-transistor" solution as you'll get. But for a pedal in mass production? The TL431 in TO-92 is 11 cents in thousands. In SMT by the millions probably <$0.01. The TL431 is used in virtually every switching PSU in the world. Many have more than one. Some say its outsold the NE555. Probably the highest-turn SKU of most Chinese contract manufacturers. You could do the same thing with 1/4 an LM339 or 1/2 and LM393 (393 is dual) or an op amp but you'd need 2 more resistors and a bypass capacitor for the reference string. Add hysteresis and that's two more resistors. For flashing an LED near overload I just don't think it gets any simpler than this and the performance - for what it is - is better than anything I've ever tried. If you want to piss on it fine. Be my guest. I wrote a long answer but the website ate it, and I am losing interest. Please do not take my observations personally. I'm old and tired and a little extra grumpy first thing in the morning. Yeah the whole infrastructure broke this AM. Once the webserver came back up I had to wait for the SQL server to come up. My post got eaten too.. Here's a different drawing showing the TL431 as a level comparator. 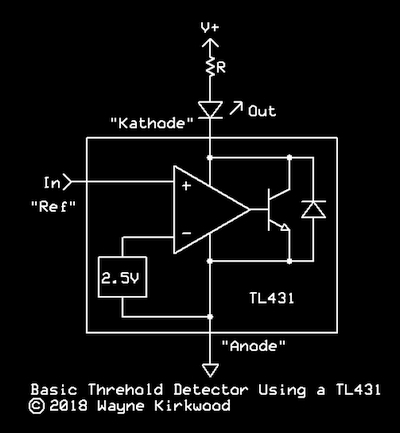 Threshold detection is one of the TL431's many applications. The internal transistor can sink as much as 100 mA. The saturation voltage is deliberately high to maintain current for the internal reference.